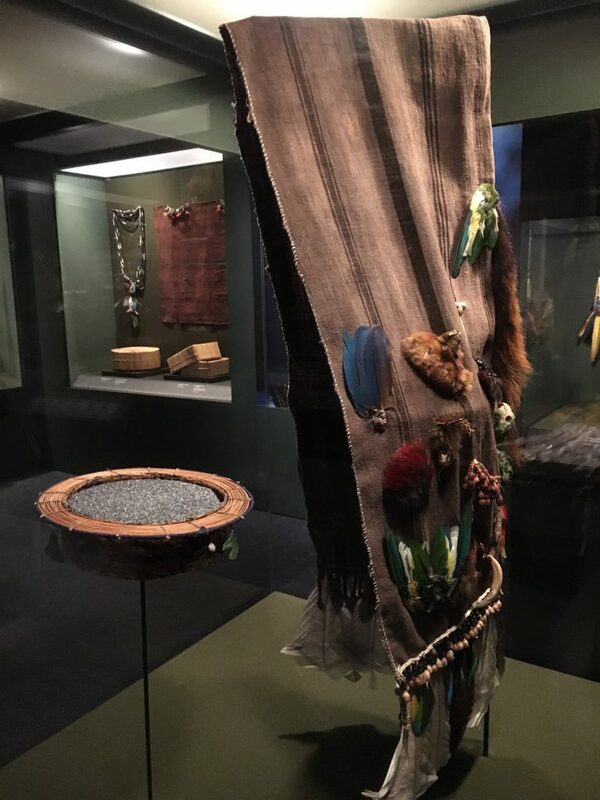 Pictured above is a Campa Shaman’s hood, the fourth object to be discussed in our 5 Of The Most Magical Objects In Our Collection series ( click HERE to see the other blogs in the series). You may have noticed that the hood has the body parts of a number of birds and small animals sewn to it. These body parts are believed to contain the spirit of the animal and increase the spiritual powers of the shaman when he’s wearing it. The Campa are a tribal people who live along the border of Peru and Brazil in Western Amazonia. Their settlements are small with a few families, often related to each other, under the leadership of a “big man”. The people of the Campa tribes do not believe in gods, only spirits who take the form of various animals. In general, the difference between gods and spirits is the amount of cooperation you can expect from the entity. Spirits are aloof and harder to predict or control through ritual human action. The Shaman’s job is to act as an intermediary between the human world and the spirit world. 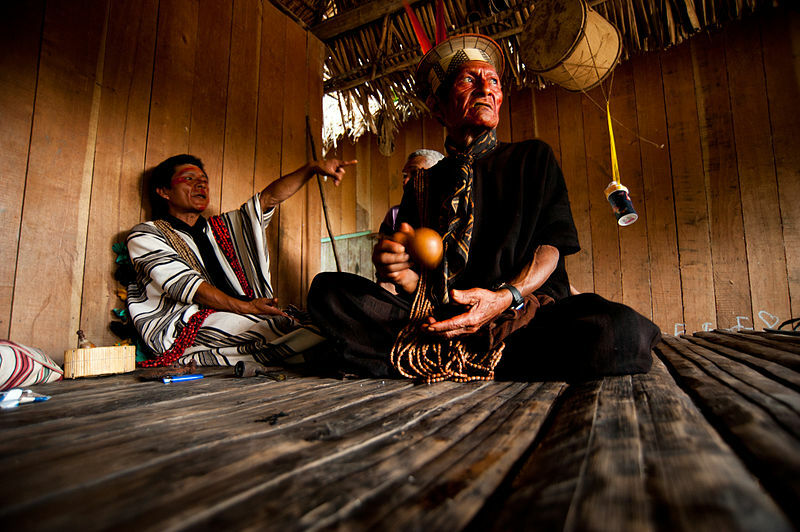 They communicate with the spirit world through music or by smoking or ingesting tobacco or hallucinogens, such as ayahuasca. Indígenas Ashaninka Aldeia Apiwtxa Acre, Brasil © Pedro França/MinC. Source: Wikimedia Commons. One of the Shaman’s most important jobs is treating illness. It is believed that some illnesses are caused by evil spirits in the form of animals, often insects such as ants or wasps. It is also believed that these spirits can influence humans and instruct them to inflict disease on another person. It is the Shaman’s job to determine the source of the disease. If he declares the illness was caused by another person in the village, then tensions can arise. Children, usually girls, are most often blamed for disease because it is believed their innocence renders them more susceptible to the influence of evil spirits. In the past if the sick person died, the child blamed would either be killed or sold into slavery. During his healing rituals, the Shaman communicates with his helper spirits to locate the source of the disease. Hoods, like the one pictured above, are believed to enhance the Shaman’s spiritual powers. Most people who visit our special exhibition Out of the Amazon: Life one the River pass this piece without realizing the important role it played in the Campa culture before making its way to our museum. To his people, the man who wore it was a heroic figure, battling evil spirits in an invisible world. To many of us in living in the modern, industrial world he is considered a dangerous product of superstition. Either way, the man who wore this hood was a powerful figure in his society. You are invited to come to our exhibit, see the objects and read about the diverse cultures of the Amazon Basin, including the Campa; decide for yourself what you think. The Sensation Migration: How Chilis Rocked The World!